Many YouTubers can make money from their site by showing an ad before their video is played. It is important to realise that YouTube is monetised by Google AdSense - meaning that it is actually AdSense and not YouTube that pays you. AdSense is CPM (cost per million) based which means it pays for every 1,000 YouTube Ad impressions you get. YouTube's CPM is reported to be on average US$ 7.6, which means you should typically expect to get paid approximately £5 for each one thousand views. The advertisers may also offer CPC (cost per click) which means that you get paid an incremental amount when a user clicks through to the advertiser site. These rates vary by product and by geography and in relative terms remain quite low as the retailer is paying for traffic to their site rather than actual sales. AdSense uses a sophisticated algorithm to determine how often and when an ad is displayed. This means that not all videos will show advertisements as AdSense selectively moderates advertisements to each user. Also many desktop users have web browsers with ad-blocking extensions installed, which would disable the advertisement and the impression won’t count. However half of YouTube views come from mobile devices via the YouTube app where the user can't block ads from being displayed. So for YouTubers, AdSense is basically just a numbers game and one where Google is in total control. How to make more money via affiliate marketing? Two things change when a YouTuber decides to include Affiliate Marketing in their monetisation plans. First the YouTuber can control what product ads are displayed to the user. You now choose how and when the offers are made. 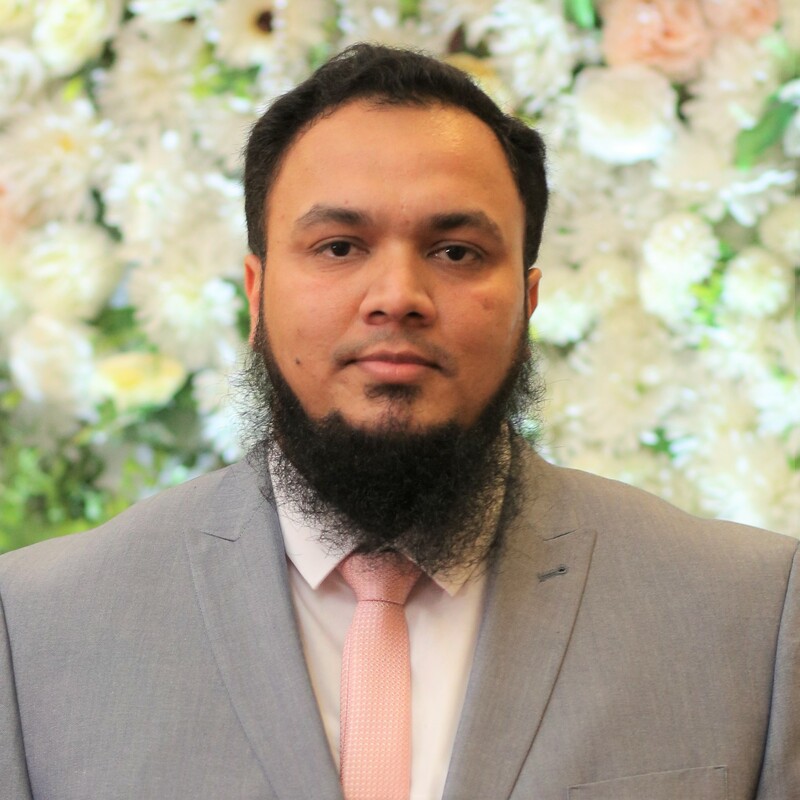 And secondly, as affiliate marketing is a Cost Per Acquisition (CPA) based model then the rewards are much higher than CPC as the retailer can now afford to pay more as they have actually made a sale. It really is a win-win situation. Let’s take an example with 1,000 views of a PC product review where the YouTuber now includes a link to a retailer store that is selling the product for £400, of which the CPA commission they pay is £24. 1,000 views x 10% CTR = 100 store visitors x 10% who purchase = 10 sales x £24 CPA commission = £240 for the YouTuber. That is equivalent to a 1% net conversion rate for the YouTuber on the product link. So instead of just making £5 from AdSense, the YouTuber now makes a total of £245 from a combination AdSense plus Affiliate Marketing. It’s quite a game changer. Let me show you how? Let’s search for a product on YouTube. I am looking for acer aspire 7 models as shown below. YouTube has presented me with thousands of results from all across the world. I can use the filter icon to select only UK or other filters. Let’s look at a typical YouTube product review video below that is one of the video posted by a user on acer aspire 7 laptop he recently purchased. I have clicked on the third video from the image above to explore it in more detail. You can see in the image above that the ads showing underneath the video are Sponsored ads by Google AdSense. The video owner may not earn anything from these ads. 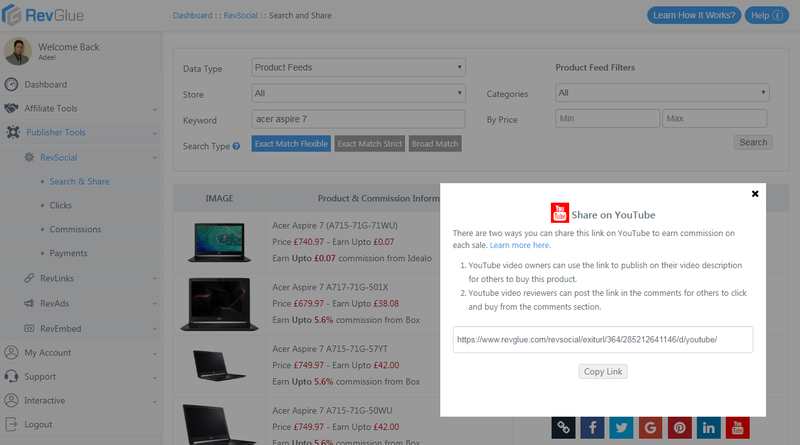 Secondly, the video owner has not posted any links in the description for users to buy this product from any retailer. Finally, the reviewers or commenters have also not provided any link to buy this product. Most of these product review video are missing two easy monetisation methods that RevSocial module can help you with to earn the highest commission on each sale. 1 – The video owner or influencer has not provided the link for user to purchase the product. 2 – The reviewers on this video are also missing the opportunity to monetise their comments by not posting any buy now link to a store. If you are a content generator on social media and in this case a YouTube video production individual or team but only utilising the YouTube ads to monetise your channel. RevGlue offers a dynamic RevSocial tools that helps YouTube and also other social media influencers to monetise their unique contents. 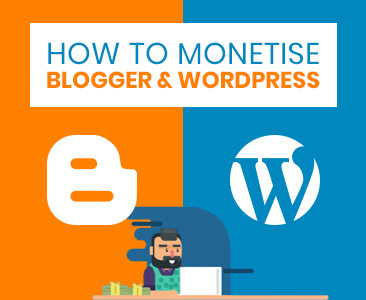 Follow these five easy steps to start monetising your YouTube product or service review videos today. Step 2 – Jump to RevSocial module under Publisher Tools menu on the left panel after logging into RevGlue user account. Please note that that the RevSocial tool is free to use for everyone. 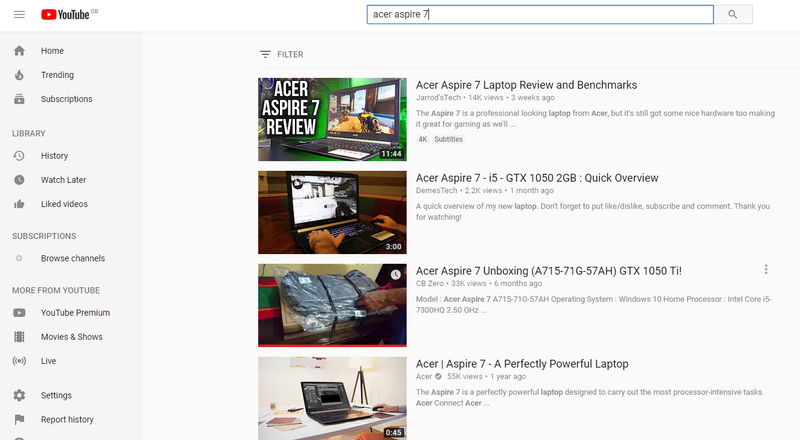 Step 3 – Search for the product such as (acer aspire 7) in our case and there are thousands of products available from RevSocial data engine. Please use the category search dropdown, price filter or try search type for exact or broad match options to find more relevant results. Click on the ? icon in front of the search type heading to learn more about this search criteria option. You are provided with five sets of unique data banks here. 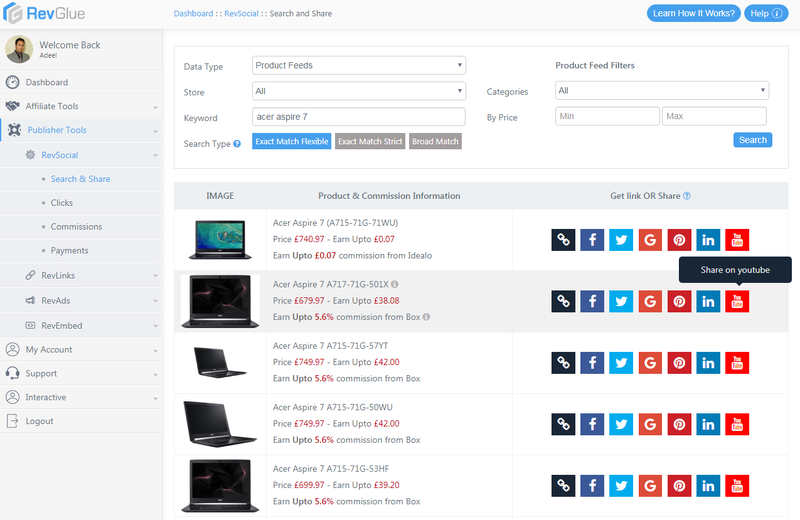 Product Feeds - Use product feeds from Data Type dropdown if you are searching for electronics and generic products from all UK leading ecommerce stores. Daily Deals – Use daily deals data type if you are searching for deals ending soon or deals like Groupon offers such as beauty deals, restaurant or travel deals. Coupons – You can also find coupons available for particular store. Banners – Find banners from all UK eCommerce stores. Mobile Comparison – Find a unique mobile deal such as iPhone or Samsung latest mobile offers from UK eCommerce stores. The data is segmented in different data types to make it easy for you to search relevant offers and deals. Each data set has its own unique filters so you can drill it down to SKU or product level. Once you have found the product as shown in the above image, click on any social media button to share on these channels or for YouTube click on the Share on YouTube icon. That will open a popup for you to provide you unique link that you can publish on YouTube. Please read the price and the potential commission you could earn from sharing that deal or product. If you to get an ad format then click on Get Link first icon to get html version of this ad link. 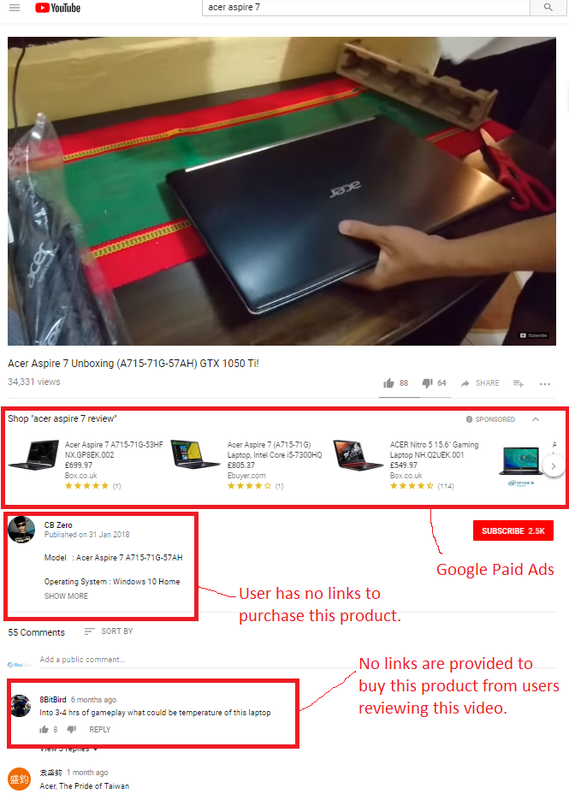 The pop-up provides a unique link as shown in the image above that the YouTube video owner could post in the description for his video viewers to buy the product easily. The users who have added reviews could also post it in the review section for others to click and buy the product. The YouTube video owner will then earn the commission on each sale that is being directed with this link to the eCommerce store. The video in our example has 34k views and even 1% conversion rate could help him generate 340 sales for the eCommerce store. Let’s image that if each sale could earn him min of £24 then he could potentially earn £8160 in commissions. The same opportunity is available for the 55 reviewers who have commented on this video. They could also refer users with their own unique RevSocial link and earn commission on each sale. You can view each click, commissions you have earned in the left menu under RevSocial. Clicks are tracked and reported back to you in real time and the conversions are updated daily as soon as the ecommerce stores confirms the sale is genuine that takes between 24 – 48 hours. You can request the commission as cashout in your Bank or Paypal account once you have accumulated £100 in confirmed commissions. You do not require any complicated tracking or submitting forms on the affiliate networks. RevGlue manages all the tracking and ecommerce store communication for you. So what are you waiting for? 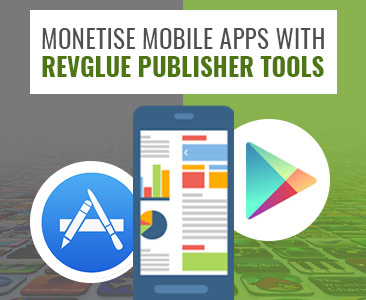 Do you have a channel on YouTube and wish to earn commission on each sale for your product review videos or even as commenting on other videos then register with RevGlue today and start monetising your social media channels with RevSocial.